Macromolecules rarely operate in isolation inside cells. At any given time, the average protein is part of a complex of over 10 macromolecules, and these supramolecular complexes are in turn embedded in intricate networks inside cells. We are broadly interested in revealing the structure and function of macromolecular complexes in their natural environment at the highest possible resolution in order to reveal their structural dynamics and interactions. We call it bringing structure to cellular biology. We have a strong focus on building tools for quantitative cell biology, using cryo-electron microscopy and tomography, cell biophysics, computational analysis, and integrative modeling. This potent combination allows us to look at macromolecular complexes in their native environment and derive their structure, context, and interaction partners. Our biological focus is on the study of the nuclear periphery, as nuclear biology remains one of the most exciting challenges in the cell, and it is uncharted territory structurally. Our thrust in this area includes projects such as: the structural dynamics of the yeast nuclear pore complex, the mechanical communication between the cytoskeleton and the nucleus, and the molecular architecture of the genome and its association to the nuclear envelope. We also collaborate with different laboratories to open windows into various cellular events. These projects tend to have a translational component, and include studying the inner life of bacteria and studying the effects of LRRK2 in Parkinson’s disease, among others. Assembly of a nucleus-like structure during viral replication in bacteria. V. Chaikeeratisak, K. Nguyen, K. Khanna, A.F. Brilot, M.L. Erb, J.K. C. Coker, A. Vavilina, G.L. Newton, R.Buschauer, K.Pogliano, E.Villa, D.A. Agard, J. Pogliano. Science. 355:194-197, 2017. Visualizing the molecular sociology at the HeLa cell nuclear periphery. J. Mahamid, S. Pfeffer, M. Schaffer, E. Villa, R. Danev, L. Kuhn-Cuellar, F. Foerster, A. A. Hyman, J. M. Plitzko and W. Baumeister. Science. 351:969-972, 2016. A photoactivable multi- inhibitor nanoliposome for tumour control and simultaneous inhibition of treatment escape pathways. B. Q. Spring, R. B. Sears, L.Z. Zheng, Z. Mai, R. Watanabe, M. E. Sherwood, D. A. Schoenfeld, B. W. Pogue, S. P. Pereira, E. Villa, and T. Hasan. Nature Nanotechnology, 11:378, 2016. Architecture of the RNA polymerase II-Mediator core transcription initiation complex. C. Plaschka, L. Lariviere, L. Wenzeck, M. Hemann, D. Tegunov, E.V. Petrotchenko, C.H. Borchers, W. Baumeister, F. Herzog, E. Villa, and P. Cramer. Nature, 518, 2014. Native architecture of the Chlamydomonas chloroplast revealed by in situ cryo-electron tomography. B. D. Engel, M. Schaffer, L. K. Cuellar, E. Villa, J.M. Plitzko, W. Baumeister. eLife, 2014. Finding the right fit: chiseling structures out of cryo-electron microscopy maps. E. Villa, K. Lasker. Curr. Opin. Struct. Biol., 25:118–25, 2014. Opening windows into the cell: focused-ion-beam milling for cryo-electron tomography. E. Villa, M. Schaffer, J.M. Plitzko and W. Baumeister. Curr. Opin. in Struct. Biol., 23, 771–777, 2013. Elizabeth Villa completed her PhD in Biophysics at the University of Illinois at Urbana-Champaign as a Fulbright Fellow. She was a Marie Curie Postdoctoral Fellow in the Max Planck Institute of Biochemistry in Munich. She joined the Chemistry and Biochemistry Department faculty at UC San Diego in July 2014. In 2016, she was awarded an NIH Director’s New Innovator Award. 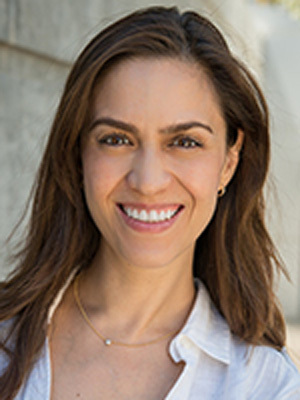 She joined the Division of Biological Sciences faculty at UC San Diego in March 2017.